Classic Film and TV Café: Sark and Rick Discuss Brian De Palma's "Body Double"
This post is being republished as part of ClassicBecky's and Dorian's The Best Hitchcock Movies (That Hitchcock Never Made) blogathon. Click here to read other entries in the blogathon. Sark: In keeping with the idea of deception in the form of acting, it's interesting that Jake's "real life" is the Hitchcockian world. His girlfriend betrays him, he's allowed to stay in an extravagant house, he spies on his beautiful neighbor and eventually shadows her. He's no longer on the movie set, but his life is a movie. And, as we learn, these occurrences in his life are for a "role" that's been scripted for him. And he still can't act, just like in his class. But when he moves beyond the "movie," he enters the adult film industry, and it seems more real than his life. That's because, in actuality, it is real, whereas he was previously being set up as the witness. But he's great as the producer. So he essentially steps off the movie set again. Only this time, he's making his own film, and doing a darn fine job of acting. It's funny that he tells Holly he's interested in her starring in one of his films. He's lying to her, but in another way, he's being truthful. She's in his movie, and I guess that would mean Jake is making a sequel to Sam's movie, right? Rick29: Great point! And the climax to Jake's film is when he's trapped in the grave with Holly. And what does he do? He uses a method acting technique to overcome his claustrophobia. He remembers what it was like to be trapped--a "sardine"--in the grave in the movie set. Then, he uses that feeling as motivation to overcome his fear and get out of the real grave. By the way, I forgot to mention my favorite of De Palma's visual gags: The title of the movie is shown over a desert landscape. The camera begin to pan apparently, but it turns out that it's the desert that's moving--it's just a canvas backdrop being wheeled around a movie studio. Right from the start, De Palma lets us know that he's going to play with what's real and what's not. To read the rest of this discussion, click here to go to the Corner in the Cafe. Wow! What an excellent, insightful post! I loved this, Sark and Rick. I felt like I was paging through a chapter in a film commentary on "Body Double." But my beverage of choice would have been a mocha frappe, with cinnamon and whipped cream on top. I think Sark would do an excellent job with a film commentary on BODY DOUBLE. We just send a letter to BDP! Both Hitchcock and De Palma are "stylists" as are you guys. Really a fantastic post. I've come to expect nothing less than stellar from The Cafe and you don't disappoint. What a great read! Now I have to re visit Body Double. Thanks, Aurora. I think BODY DOUBLE gets unjustly dismissed as "another De Palma Hitchcock rip-off." It's actually a well-made, witty examination of perceived reality and--yes--the craft of acting. Thought-provoking analysis on De Palma's best and most Hitchcock-like film. If you were to extrapolate where Hitchcock was going with "Frenzy" I think you'd find that "Body Double" would have been the type of movies he'd made. I don't mean that he'd be doing homages to himself. But "Body Double" has a harder edge than "Psycho" or "The Birds" or Hitch's suspense films before those. I couldn't agree more and have made that same comment myself. Thanks, John. 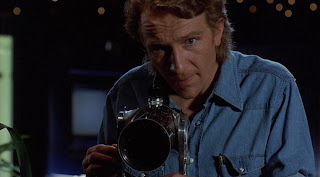 I enjoyed watching BODY DOUBLE again and it's always a delight to engage in a thought-provoking discussion on a film (especially one that sometimes get a bad rap).